Home / Recovery / What is Windows RE? How to boot to Windows Recovery Environment? 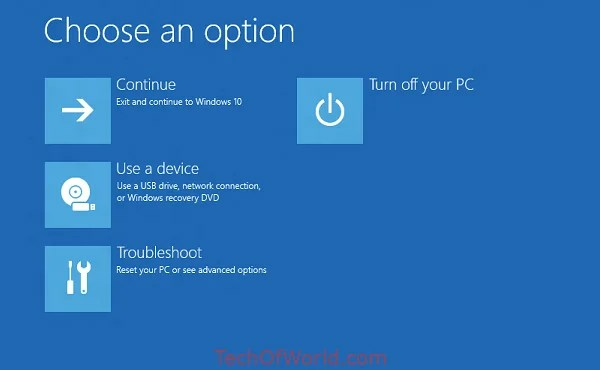 If you been using Windows for long, I make sure you know about the Advanced Recovery mode. The blue colored screen which offers options to fix, recuperate, recover, command line option, and so on. That’s the screen Microsoft calls Windows RE or Windows Recovery Environment. In this overview, we will share extra on Windows RE, and also just how too to the Windows Recovery Environment. Windows RE can repair common issues which cause an unbootable operating system. Microsoft has also made it possible for the IT admin to customize it. They can add additional drivers, languages, diagnostic tools and can also include parts of Windows PE (Windows Preinstallation Environment). It is available on all Windows 10 and Windows Server installations. Windows RE is preinstalled on the OS, so you don’t need to create a bootable USB or ISO when troubleshooting. What can Windows RE do? System image recovery for Windows Server 2016, Server 2012 R2 and Server 2012 only. Since Windows RE is preinstalled in Windows 10, you can boot into it. There are multiple ways to do it. If you are stuck on the login screen, click on the Shutdown button, and then choose to Restart holding down the Shift key. When inside Windows 10, go to Start > Settings > Update & security > Recovery > under Advanced Startup, click Restart now. You can use a recovery media to boot into Windows RE. Some OEMs offer hardware recovery button or combination to boot directly into Windows RE. It is useful when you are facing a BSOD, and you don’t have a recovery media. After following any of these, you will have two options in the Boot Menu. The first is to boot into Windows RE, and second to boot normally into the Windows OS. In Windows 10, the local copy of Windows RE gets an update as part of the OS updates. Usually, a newer version of the Windows RE image replaces the existing one. Two consecutive failed attempts to start Windows. When the computer abruptly shuts down more than twice and within two minutes of the boot process. BitLocker error on touch-only devices. These tips should help you boot into the Windows Recovery Environment.